Curcuma root (Yujin)-Curcuma longa L.
Part Used & Method for Pharmaceutical Preparations: The tuberous roots are dug in autumn or winter. After removing the fibrous roots, the roots are cleaned, boiled, dried in the sun and cut into slices. 1. Qi and blood stagnation: a) pain in the chest, abdominal or hypochondriac regionsCurcuma root (Yujin) is used with Red sage root (Danshen), Cyperus tuber (Xiangfu), Bupleurum root (Chaihu) and Bitter orange (Zhiqiao); b) dysmenorrhea due to qi and blood stagnation. Curcuma root (Yujin) is used with Bupleurum root (Chaihu), Cyperus tuber (Xiangfu), White peony root (Baishao) and Chinese angelica root (Danggui). 2. Mental derangement due to interior damp-warm attacking. 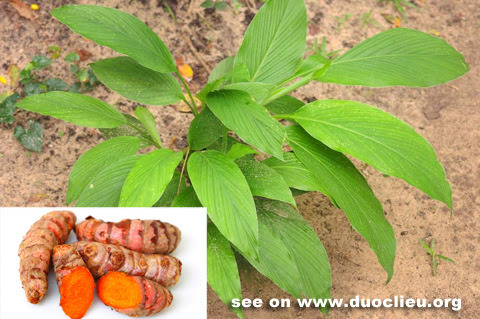 Curcuma root (Yujin) is used with Grass-leaved sweetflag (Shichangpu) in the formula Changpu Yujin Tang. 3. Jaundice due to interior accumulation of damp-heat. Curcuma root (Yujin) is used with Oriental wormwood (Yinchenhao) and Capejasmine (Zhizi). Cautions & Contraindications: This herb should not be combined with Cloves (Dingxiang).